Mediation is a well established technique for dispute resolution which can help you and your former partner to agree on what is best for you, your family and your property. Mediation is a self-directed process that puts your future in your hands. It enables you to make your own decisions for you and your children. Mediation is a well established technique for dispute resolution which can help you and your former partner to agree on what is best for you, your family and your property. Mediation is a strategy that enables you to take control of your situation. You will be able to take responsibility for your decisions and actions. Mediation is a low cost and efficient solution. Usually, mediation is only 50% of the cost of legal proceedings. Mediation is much quicker than going through legal routes. Our mediators are fully trained and experienced. We can discuss a range of issues during mediation including property, finances and issues related to children. Mediation is not therapy, but it proceeds through talking about, and deciding upon, what you need to do in the future. It involves all aspects of divorce and separation decisions. As it is an equitable process, mediation is a way to improve your future situation. Children, in particular, benefit from mediation as it involves them in the process. It also helps your children to have continuity in their relationships. 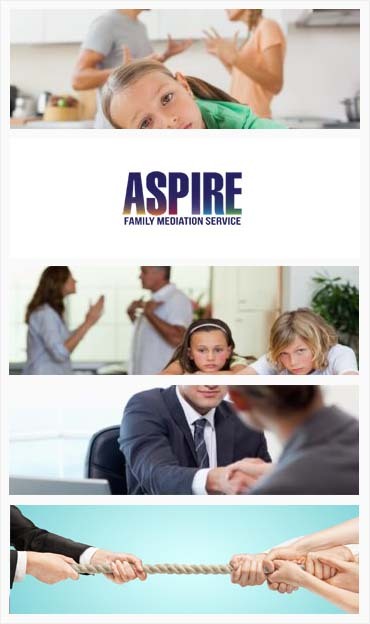 The end point of mediation is to make sure that each of our clients is happy with the outcomes of the process and to make sure they can move on with their lives, maintaining happy relationships with their children. As our mediators are trained to deal with all sorts of family situations they can help you to sort through your problems and to make the changes needed to adjust to your new situation. We also offer services for solicitors and other legal professionals. Mediation is not just for divorcing, or separating, couples. It can include a range of other parties. Children and adult siblings can be included in mediation. You can also include members of the extended family such as grandparents. Mediation can also help teenage parents to resolve issues concerning finances and childcare. The real benefit of mediation is that it is inclusive and ultimately improves communication and trust. Mediation is not just about personal relationships, but can aid you in making decisions concerning finances and property. Mediation can cover a range of different situations. Most obviously, contact between children and parents and the residence of children can be discussed and agreed upon. Mediation also involves discussion of parenting arrangements which can involve consideration of holidays, maintenance and child support and education. Financial issues can include a range of different problems. These can include pensions, endowments, debts and other financial issues. Mediation is a non-judgemental environment for you to enter in open discussion, and to make decisions. Mediators do not offer legal advice. Mediators are not biased towards one particular party. Mediators do not offer services such as counselling or therapy. Mediation is a process that helps you to rebuild your relationships. Mediators do not tell you what to do, you control the process. Mediation gives you the possibility of making choices. Mediation is a way to make a solid arrangement for your future. Mediation has been shown to be an open-ended process that is easy to understand. Rather than the formality and expense of a legal procedure, mediation operates in a less structured environment that leads to a solution that you can settle upon. As there are no legal costs associated with mediation, it is much cheaper. In most cases, people find that they are able to get on with their lives having developed constructive relationships with their former partner and children. The process is designed to help you to move on with your life. Mediation is not compulsory, and you can withdraw from the process at any time. It is an efficient process that can be ended quickly and amicably. The first step in the mediation process is a meeting between you and your former partner. These meetings are held privately and can be held separately or together. We normally advise that the meetings are held separately, although the flexibility of mediation allows for all possibilities. To reassure you, there will always be a period in the meeting where we will agree to speak to you separately. Of course, if there are any issues of violence or intimidation we will talk to you about this. This may make mediation unsuitable for you. At this initial meeting we will talk about what you aim to gain through the mediation process and address any concerns that you have. One thing that you need to know about mediation is that since April 2011 it has been a requirement that anyone who wishes to attend court for legal proceedings involving divorce or separation should show that they have attended mediation meetings. These meetings, known as MIAMS (Mediation Information and Assessment Meetings) are a service that we offer. There are exceptions to MIAMS, if there is domestic violence, or if an urgent court application is involved. Our mediators are trained to conduct these meetings. If you do not go ahead with these meetings you will have to complete a form (FM1). We can assist you with the completion of the FM1 form. After the initial meetings, you will be attending joint meetings. These can be arranged at times that are convenient for you both. Joint meetings are very helpful as mediation is about constructive communication. At the end of the series of joint meetings the mediator will help you to put together a written agreement which records the decisions that you have made. Of course, you do have the opportunity to seek legal advice if you want to commit yourself to a legal agreement, court order, or other legally binding contract. After receiving your referral we will move to the individual meetings within fourteen days. On average, you can expect to attend between three and five mediation sessions of between an hour and ninety minutes in length.. The number of sessions, and the length of the sessions, will obviously vary due to your personal circumstances and the form and complexity of issues that require discussion.